They may give you heartburn, but they also have great health benefits when consumed in moderation -- here are a few positives associated with spicy foods. Spicy food is enjoyed all over the world because spices add an incredible amount of flavour to what you eat. Cultures all over the world have dishes that excite and stimulate your palate with spices and add heat and taste to everyday ingredients. But if you like spicy food like chillies, curries and hot sauces, there is so much more to look forward to. Weight-loss: Hot peppers contain capsaicin, which can speed up metabolism and help the body burn calories faster. This is because capsaicin increases your body temperature and contributes to an increase in your heart rate. Furthermore, studies have shown that people who eat spicy foods eat smaller portions, which can reduce their calorie intake. Heart health: Pungent food is good for heart: Hot peppers help to improve heart health by improving the body's ability to dissolve blood clots. Research has shown that low-density cholesterol (LDL or bad cholestrol, which can clog your arteries) resisted oxidation for a longer period of time when chillies were added to the diet, thus reducing the heart stroke risk. The capsaicin in peppers also fights inflammation, which has been identified as a risk factor for heart disease. Additionally, statistics show that cultures that eat spicy foods frequently have a much lower rate of heart attacks and stroke. Improved circulation: Spicy foods also promote good circulation, and they appear to lower blood pressure. When you eat spicy food, your body's temperature is raised; therefore, it increases your blood flow and gets your heart pumping. Peppers help strengthen the blood vessel walls as they are high in vitamins A and C.
Anti-cancerous properties: Many studies have shown that regular consumption of chillies and curry decrease the risk of cancer. Capsaicin slows the growth of cancer cells and in some cases, even causes the cancer cells to die off without harming the surrounding cells. In countries where diets are traditionally high in capsaicin like India and Mexico, people tend to have lower rates of some cancers. Improved digestion: Spices also improve your digestion because they increase the hydrochloric secretion of your stomach. This in turn will increase blood flow to the stomach and even increase the mucous lining. Capsaicin also helps to kill bacteria like H. pylori and helps to prevent or cure stomach ulcers. However, if you get heartburn from spicy foods, try taking an antacid relief tablet which will neutralise acids in the stomach. Arthritis: Turmeric (haldi) reduces joint inflammation and bone destruction. Circumin present in turmeric helps to alleviate the pain associated with arthritis. Cold and flu: Capasicin promotes sweating and eases the discomfort of cold and flu symptoms. It also helps to open up the nasal passages. It may also reduce sinusitis, and other flu symptoms. Improved sleep patterns: Australian researchers have found that people who regularly consumed spicy meals fell asleep more easily. They also woke up easier and had more energy throughout the day. Mood lifters: Chillie peppers boost the level of endorphins and serotonin, both of which dull pain and give us a feeling of wellbeing. They can act as depression fighters and powerful stress relievers. Improved breathing: Hot peppers act as an expectorant, and can help people with asthma, chronic bronchitis, emphysema, sinusitis and other respiratory conditions breathe easier. 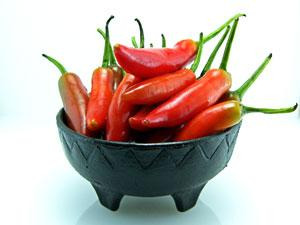 Hot peppers can help you to breathe better by opening up clogged nasal passages. It is important to take spicy foods moderately, especially if you have a sensitive stomach or simply a low tolerance for them. Learn to have your food medium-spicy and hot to enjoy the amazing heath benefits that go along with it.